Adventures in Pin Loom Weaving—Tie a Colored Ribbon . . .
I’m in the middle of cataloging my collection of patterns and squares, but that’s really boring work. Creating patterns, weaving, and even winding skeins of yarn are all more alluring activities. And staying up later than too late–who could resist? I drew this last night and refined it a little this morning. It’s off-center, so if you’re trying to follow the graph move the whole pattern one square to the left, and, uh . . . Don’t try to follow the graph. ***Remember: you can click on a photo to see a larger version. Click the back arrow to return to these instructions. Through the magic of Paint, I was able to alter the prototype without actually making another square. And last of all, again courtesy of Paint, I was able to see how it would look if I added beads to the floats–below are two different views. Beads are left off the the topmost row (even though floats are there) and from the bottom two corners. I prefer this version, though I’d leave the beads and floats off at the bottom corners. 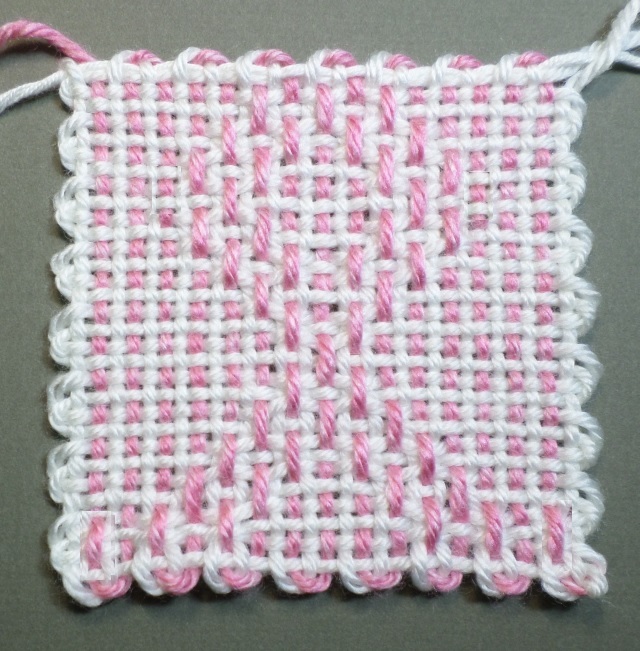 This pattern continues into woven R16 (which is ordinarily a solid plain weave row), so when you take the square off the loom there are two floating warp loops. On the sample piece, I’ve secured them with a piece of matching scrap yarn. If you were going to join these squares to others I’d leave the scrap there till you’re ready to sew; then pull it out when you’re ready to join the squares. You could also crochet around the edge of the square and that would secure those floating loops (remove scrap yarn prior to crocheting). You could also just leave them floating; because there are only two floating warp threads no serious damage will occur. Weaving (L4) occurs from the top (3/4 edge) downward and the pattern will emerge ribbon ends first (nearest you). For this reason, the instructions are given from R16 to R1. 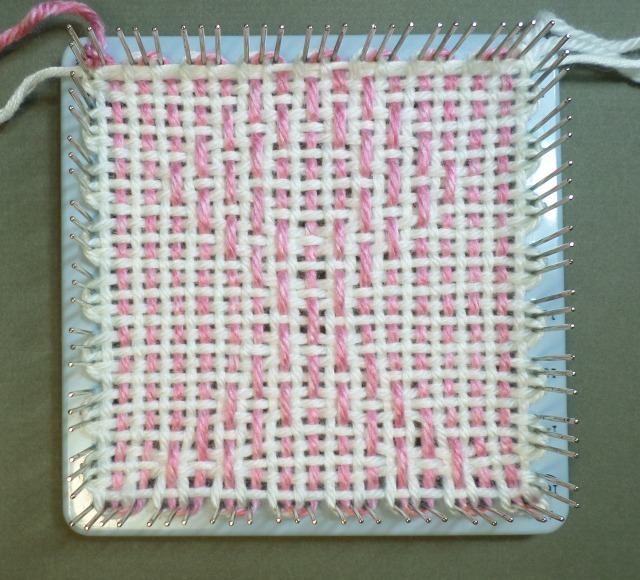 Weaving in this manner results in the L4 weft threads encircling only one pin at the beginning and end of each row. This will not affect the finished look of the square. If you look closely you can see how the L4 threads wrap only one pin on the outer edges. Your first and last rows should be against the top and bottom pins. The loom shown here is “upside down,” meaning corner 1 is at the top right. The warping configuration, and yarns used, for the sample square is L1,2, &4: Bernat Satin “Silk” / L3: Lion Heartland “Denali.” I considered also making L1 pink. Not sure if the design would show up as well, but it might. Warping L3 different from the others can be tricky. 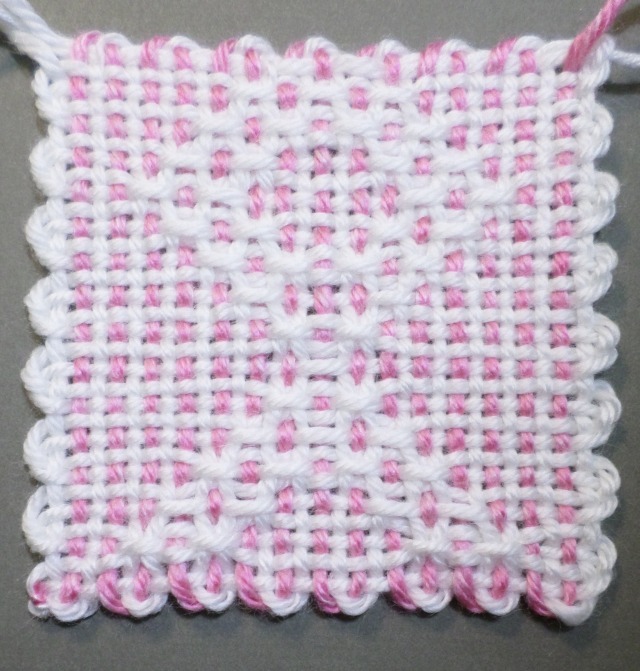 The pattern immediately below is for the prototype version. Variations on the basic pattern follow. 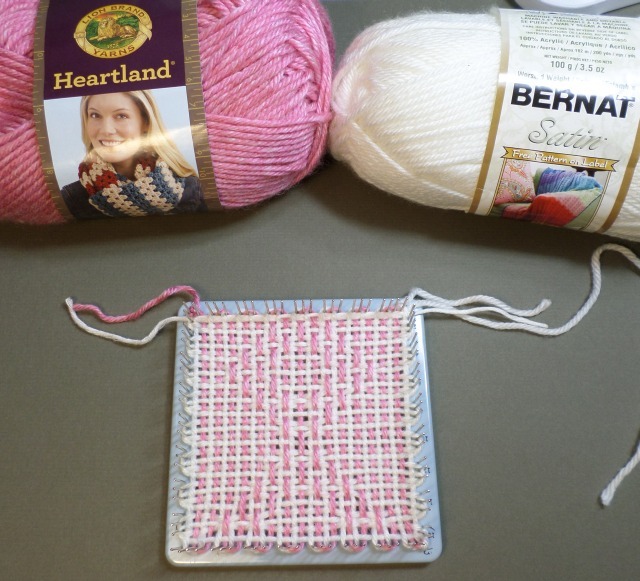 To add beads: place beads on L3 warp strands. I recommend 45 beads as shown in the photo below. My preferred version with beads, without feet in the corners. Also, notice the scrap yarn anchoring top of pattern. This can easily be slipped out if desired. Someone asked me what floats were and what L1, L2, etc. means. Here’s my answer: A float is a thread that should have been woven over (or under) as in plain weave. Instead it’s left to “float” above the weaving as part of a pattern. In the pink ribbon all the vertical pink strands that make up the ribbon picture are floats. L1 refers to the first layer of warping on the pin loom. There are 3 warping layers. The fourth layer is woven with the needle. This is nice to hear. I’m tickled I could use my experience to do something for someone else. 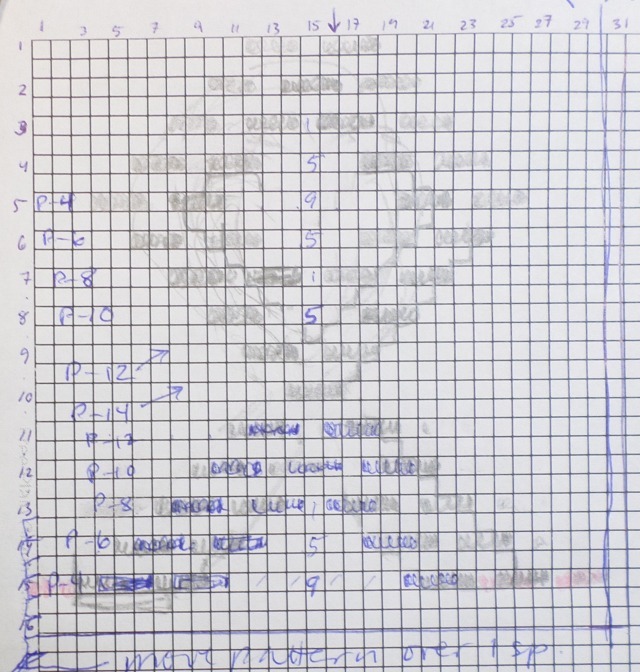 It was a bit challenging, but easier than designing patterns used to be. It’s nice to see how much I’ve learned. Thanks, Sue! Can’t wait to try both versions plus add beads! I’m so pleased it has personal signifcance for you. It’s a wonderful feeling doing something meaningful for someone else.